Against the backdrop of the human tragedies that unfold on a daily basis in the waters of the Mediterranean and refugee camps in Europe and the Middle East, it is reasonable for psychologists and other social scientists to ask themselves whether their discipline can offer any answers to the questions that these events pose. For example, why do politicians and citizens in at least some Western countries find it difficult to welcome those fleeing warfare or persecution? What kinds of problems are encountered by refugees once they have been given permission to settle temporarily or permanently in a new culture? How can their welfare be improved by changing the ways in which services are delivered? These are some of the issues that were addressed in a two-day meeting held in Cardiff at the end of August 2016. The meeting was sponsored by SPSSI-UK (see below) and Cardiff University, and attracted 35 delegates (mostly academics, but with some key representatives from the policy community) with a specialist interest in these questions. The meeting was organised around three themes: acculturation (the process by which both hosts and migrants adjust to each others’ cultures); prejudice, culture and health; and media representations of and public discourse about migration. Below, other authors come on to more details of how some of these themes were addressed. In our own piece, we look to address the broad psychological factors involved in migration and immigration, and thereby highlight how psychology could address some of these questions. One issue that became very evident during the Cardiff meeting is that psychology, as a discipline, is not always seen as relevant when it comes to drawing up policies about immigration. This is despite the fact that psychological assumptions are at the core of the immigration debate. Not all of the blame for this state of affairs belongs to those in the policy community; we as psychologists have not always been effective in explaining how our research is relevant to this issue. The reluctance of some citizens to accept migrants to their country; the problems that migrants face; and the way in which these issues are represented in the media and everyday discourse; these are all phenomena that clearly have a psychological component. Yet this seemingly obvious point is not often recognised. One goal of the Cardiff meeting was to make the relevance of psychology to these issues more evident. Part of the problem, it seems, is that psychologists – even those whose work is applied and policy-relevant – are often seen as dealing with problems at the level of the individual. This means that for any event or phenomenon that has a collective or societal aspect (like migration), psychologists tend not to be regarded as having relevant expertise to offer. Yet many of us – including social psychologists, community psychologists, and media psychologists – explicitly deal with issues that go beyond the individual; our interests and expertise lie in how people relate with and respond to others, especially as members of one social group relating to other social groups. For example, although migrants are of course individuals, in policy and media terms they tend to be treated as a group, as a collective. This is also how they tend to be thought about by citizens: ‘them’, as opposed to ‘us’, with all of the threatening implications that such a view of the world brings with it. However, there are times when the collective noun ‘migrants’ is supplanted by an event that forces us to re-frame the issue as one that affects individuals. This was the case when photographs of 3-year-old Alan Kurdi, lying lifeless on a Turkish beach were widely circulated in newspapers in September 2015. Even newspapers such as the Daily Mail, not exactly renowned for having a pro-immigration stance, described the images as ‘harrowing’ and as ‘highlighting the horrific human cost of the global migration crisis’. Unfortunately, the outpouring of sympathy, well intentioned policy statements, and charitable donations that followed this event were quite quickly superseded by a more ‘normal’ state of affairs in which migrants were once again treated as a collective, as Alastair Nightingale and Simon Goodman explain below. What their analysis makes clear is that the very terms in which the immigration debate is conducted are not neutral, because the term ‘migrant’ is spoiled. It is not just that the migrant is outgroup; it also signifies a lack of belonging to any place, a threat to indigenous people (since the migrant has chosen to come over and wants what ‘we’ have) and a lack of rights in a world where rights attach to place. Constructing immigrants as a group, whether they are migrants, refugees, or asylum seekers, tends to encourage the perception that ‘their’ interests, values and traditions are competing with ‘ours’. As psychologists, we know that this competitive vision stimulates negative emotions, such as fear, and negative attitudes, in the form of prejudice. The fact that some participants in the campaign for Brexit played up this 'zero-sum' view of migration has apparently stimulated an upsurge in hate crime and other expressions of prejudice in the wake of the referendum result. There is a sincerely held view among large numbers of UK citizens that the everyday problems they face in finding or keeping jobs, getting paid a living wage, having housing fit for habitation, getting their children educated in a good school, and having ready access to healthcare are, in some way, attributable to immigration – even in parts of the UK where there are few, if any, migrants. The Brexit result has also apparently made some citizens feel that they are entitled to express an open antipathy towards migrants. And this is in spite of the fact that some of the very services that we all depend on, like the NHS, could not function without the labour provided by immigrants, just as the wider economy needs immigrants if it is to be successful. The challenge faced by rich, western democracies is to find ways of coping with the steady increase in ethnic diversity that a changing world brings about: ways that are fair and inclusive, and are recognised to be fair and inclusive by citizens of host countries. We know from research that members of different social groups are more likely to cooperate and regard each other in positive terms if they do not see their respective groups as competing for limited resources, and if they have positive experiences of interacting with members of the other group. It will be much easier to achieve these objectives if social and economic inequalities within host societies are reduced. Citizens who experience worthwhile improvements in their own daily lives will be less receptive to ‘explanations’ for their everyday problems in terms of immigration; in turn, they are more likely to have positive experiences of interacting with members of immigrant groups. Participants at the Cardiff meeting attempted to focus on the policy implications of research findings. Two implications follow rather directly from what was presented. First, journalists and others reporting or commenting on immigration in the media need to be careful about the language used to describe the actors involved. Second, national and local governments should consider framing and responding to the challenges posed by migration not as a migration crisis but (for example) as a ‘labour planning crisis’ in which expanded workforces require expanded resources). Whilst Europe has been described as being in the midst of a “migration crisis”, the question of whether the UK can also be said to be experiencing a crisis is much more open to debate. Although the number of people claiming asylum in the UK has risen steadily in the past four years, the numbers who claimed asylum in 2015 (32,414 excluding dependants) were nowhere near those seen in 2002 (84,132 excluding dependants) when asylum applications reached their peak (Home Office, 2016). As the media report on a daily basis, different countries within Europe have taken very different approaches to the numbers of new arrivals at their borders, with some building fences to keep refugees out and others, such as Germany, opening their borders to welcome over a million refugees. In the UK, the Government’s response has been to commit to resettling 20,000 Syrian refugees by 2020. However, thus far only a fraction of that number have arrived in the UK (2,898 up until the end of June 2016) and the political focus has seemingly been on austerity and reducing net migration to the tens of thousands, with the responsibility for integrating resettled refugees devolved to local authorities. However, this is not new. During the New Labour years unprecedented legislation on immigration and asylum was issued to create a ‘hostile environment’ aimed at deterring asylum seekers from coming to the UK. Such measures included reducing the amount of support paid to asylum seekers; giving them cashless support only in the form of vouchers which could be used at certain shops; the potential to be detained indefinitely; and agreeing to be dispersed to towns and cities outside of London in order to receive accommodation and subsistence support whilst their asylum claims are decided. At the current time, in the midst of a “migration crisis”, one might therefore think that integration would be a priority for both UK and other national governments. A rapidly developed integration law was passed in July 2016 in Germany, a country traditionally slow to embrace newcomers and in which national identity has been a precondition for belonging as a citizen. In the UK, however, despite a longer history of dealing with religious diversity and acceptance of difference, the government has long espoused a commitment to migrant integration, despite it never being a significant priority for them. Indeed, although acknowledging that integration experiences can occur whilst waiting for a decision on an asylum application, the UK government has taken the position that integration should not begin until refugee status is granted and a long-term future in the UK can be planned for. Such a position is particularly problematic in light of the “hostile environment” created by the UK Government and arguably has longer-term consequences for the acculturation of forced migrants. A key priority for the recent SPSSI-UK symposium, “The current migration crisis in Europe”, was for the meeting to be a dialogue between academics and policy makers, influenced by Kurt Lewin’s notion that “research that produces nothing but books will not suffice”. Despite being a topic of study in cross-cultural and social psychology for over 100 years, it is perhaps surprising that the policy makers at the meeting knew little of the acculturation literature, particularly at a time when millions of new migrants are being displaced annually due to war, persecution, political oppression and global economic disparities. As early as 1936, Redfield, Linton, and Herskovits produced a definition of acculturation: “those phenomena which result when groups of individuals having different cultures come into continuous first-hand contact, with subsequent changes in the original culture patterns of either or both groups” (p.149). However, the first full psychological theory of acculturation had been developed several years earlier, following Thomas and Znaniecki’s (1918) classic study of immigrants in Chicago. Research in this area has tended to follow Thomas and Znaniecki’s approach of seeing the minority culture as one which can be retained or abandoned, and the dominant culture as one which can be adopted or rejected. As such, acculturation typologies have been developed with Berry’s (2005) classic taxonomy of assimilation, integration, separation, and marginalization the most widely cited. A different approach to acculturation has drawn on Stuart Hall’s (1990) work on cultural identity and diaspora studies and is based mainly upon the study of post-colonial migrants into US and UK society. Such approaches (e.g. Bhattia and Ram, 2009) argue that the typological approach taken by many acculturation researchers is apolitical and too fixed, instead arguing that immigrant identity formation needs to be seen within historical and political contexts. In terms of acculturation typologies, many researchers have shown that some forms of acculturation are socially or psychologically beneficial and others are problematic (Berry et al., 2006; Verkuyten, 2005; Gieling et al., 2014; De Leersnyder et al., 2011) and have generally concluded that a strategy of integration, where individuals seek to maintain ties with both their ethnic group and the dominant group, is the preferred strategy. However, the concept of integration has been treated with suspicion by some black communities in the UK and anti-racist movements who have raised concerns about integration being too close to, or a path to, assimilation. Similarly, the UK’s “hostile environment” brings into question migrants’ ability to choose an acculturation strategy, and points to a need to consider not only forced migrants’ experiences but also the policy context in which they are acculturating. As such there is a clear space for psychologists and policy specialists to work together to better understand the acculturation experiences of those forced migrants coming to the UK and to ensure that integration is put firmly back on the agenda. In many ways social policy and migration studies researchers have taken the lead in this area, although many have drawn on theories of acculturation developed in cross-cultural psychology (e.g., Phillimore, 2011). From those studies which have been conducted, which are not large in number, it is clear that many refugees and asylum seekers do struggle to integrate, are vulnerable to psychosocial stress, and have few acculturation strategies open to them. This was particularly so when dispersal of asylum seekers to towns and cities outside London was introduced following the 1999 Immigration and Asylum Act. Mainly socio-economically deprived areas with little experience of welcoming forced migrants, many of these towns and cities did not have (and many still do not have) services designed for the needs of forced migrants or existing ethnic communities that those dispersed could be a part of. This is a particularly pertinent concern at a time when the Syrian Vulnerable Persons Resettlement Scheme (SVPRS) will see Syrian refugees resettled in many areas of the UK which have no experience of refugee resettlement. In such cases, then, a strategy of marginalisation may be the only one readily available to forced migrants and consequently increase the acculturative stress felt. For asylum seekers it must be remembered that such acculturative stress may be in addition to pressures felt around the uncertainty of their asylum application (being required to defend their story, report regularly to the Home Office or a police station, and living with the threat of detention). Perhaps what is needed is a more balanced discussion around asylum seekers and refugees in the UK, and one in which the well-being of individuals is given greater concern. The current position in which we have a hostile asylum policy and forced migrants are frequently vilified by both the media and general public was highlighted recently in reports of dispersed asylum seekers’ doors being painted red in Middlesbrough and being forced to wear identifying wrist bands in Cardiff, in both cases leading to an increase in hostility reported by asylum seekers. It seems that a more humane approach is needed in which forced migrants are given the support they need to integrate and their experiences are better understood in order to ensure that they are treated with compassion rather than hostility and are not marginalized. Ensuring that research into the acculturative experiences of forced migrants continues in dialogue with policy makers will be key to moving this debate forward and it is critical that the voices of forced migrants, too often absent, are prominent within this debate. Working with third sector organisations will also be key in achieving this aim because, despite being under-funded, they are often the key link between forced migrants and wider society, providing the specialist acculturation services needed by forced migrants in the UK. Berry, J. W. 2005. Acculturation: Living successfully in two cultures. International journal of intercultural relations 29(6), pp. 697-712. Berry, J. W. et al. 2006. Immigrant youth: Acculturation, identity, and adaptation. Applied psychology 55(3), pp. 303-332. Bhatia, S. and Ram, A. 2009. Theorizing identity in transnational and diaspora cultures: A critical approach to acculturation. International Journal of Intercultural Relations 33(2), pp. 140-149. De Leersnyder, J. et al. 2011. Where do my emotions belong? A study of immigrants’ emotional acculturation. Personality and Social Psychology Bulletin 37 (4), pp. 451-63. Gieling, M. et al. 2014. Dutch adolescents' tolerance of Muslim immigrants: the role of assimilation ideology, intergroup contact, and national identification. Journal of Applied Social Psychology 44(3), pp. 155-165. Hall, S. 1990. Cultural identity and diaspora. in Rutherford, J. (ed.). Identity and Difference. London: Sage, pp.221-37. Herskovits, M. et al. 1936. Memorandum for the Study of Acculturation. American Anthropologist 38(1), pp. 149-152. Phillimore, J. 2011. 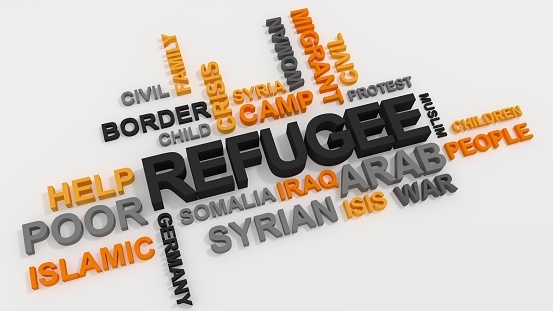 Refugees, acculturation strategies, stress and integration. Journal of Social Policy 40(3), pp. 575-593. Thomas, W. I. and Znaniecki, F. 1918. The Polish peasant in Europe and America: Monograph of an immigrant group. University of Chicago Press. Verkuyten, M. 2005. Immigration discourses and their impact on multiculturalism: A discursive and experimental study. British Journal of Social Psychology 44(2), pp. 223-240. Arguing against supporting refugees can be a difficult thing to do, because this can suggest that the speaker is an uncaring person who is unwilling to help people who are protected by international law and in need of humanitarian support. This means that those who argue against asylum seekers and refugees need to make their case, while also presenting themselves as pleasant and caring. One way to make these arguments is to suggest that refugees and asylum seekers are not really who they claim to be at all, and that they are coming to the UK for financial gain. This implies that asylum seekers tend to be ‘bogus’ rather than ‘genuine’ (Lynn & Lea, 2003), and hence all asylum seekers come to be doubted. As well as suggesting that refugees may be economic migrants, other economic arguments are used against refugees and asylum seekers. One of these is that the UK should address the needs of British people ahead of those of refugees and that “charity begins at home” (see Lynn & Lea, 2003). A related argument is that the presence of too many refugees can be damaging to social cohesion. Again, these arguments make the speaker appear caring and appear to advocate a positive position whilst making an argument against providing sanctuary for refugees. These rhetorical strategies work to demonise people seeking asylum, by both distinguishing and conflating people fleeing war and persecution with immigrants more generally (e.g. Goodman & Speer, 2007). It constructs a categorical distinction between legitimate asylum claimants, who deserve sympathy and assistance, and bogus “economic migrants” who deserve rejection. This division has become entrenched in public and media discourse, where it is constructed as rational and natural due to a common-sense zero-sum understanding of limited resources (Capdevila & Callaghan, 2008). It defines an acceptable means of discrimination built on the prevalent assumption that if people arriving in the country manage to improve their living standard, then citizens of the host country must be losing out. This ignores the point that increased economic activity and diversity of ideas, skills, and cultural understandings may well benefit all. But the prevalence of “economic migrant” within public discourse promotes the notion that applicants are bogus until proven legitimate, and which justifies their harsh treatment whilst individual claims are scrutinised. Clearly, employing categories is not a means to simplify the complex social world but rather it is politically motivated (Billig, 1987; Potter & Wetherell, 1987). The ensuing prejudice cannot be explained away by the traditional argument that limited cognitive resources induce people to formulate incorrect assumptions of others due to stereotypical overgeneralisation. Social categories can be purposefully constructed to demarcate the power relationship between the dominant and subjugated. This premise also acknowledges that people can reject categorical distinctions definitions and display tolerance. European citizens are far from being unanimously hostile towards the people arriving at the borders of Europe. There have been strong outpourings of sympathy and solidarity, and most people’s position is better described as ambivalent. The lack of ambiguity regarding the terrible situation that Syrian refugees are fleeing, where it is clear that the civil war has created a humanitarian disaster, means that the common strategy of distinguishing ‘bogus’ from ‘genuine’ Syrian refugees might be expected to be less available for those seeking to prevent their access into the UK. However, one of the most controversial references to the crisis, an example from UKIP’s Brexit campaign, shows that despite the footage from Syria, this is still not the case. The now notorious poster in which the slogan “BREAKING POINT: the EU has failed us all” was used as a caption for a photograph of a queue of refugees, was criticised for its resemblance to Nazi propaganda. However, when Nigel Farage was questioned by Laura Kuenssberg on the BBC about the racist connotations of the poster, he replied by suggesting that they may be “economic migrants” (Brexit: The battle for Britain, 2016). This demonstrates that the economic migration argument was deployed despite the images of refugees fleeing the Syrian civil war. And Farage’s apparently successful attempt to redefine refugees as economic migrants goes unquestioned. It is not just Farage who linked the refugee crisis with the Brexit debate; research conducted at Coventry University indicates that members of the public drew upon the crisis as a reason to leave the EU. Goodman, Sirreya and McMahon’s (in press) recent work addresses the ways that the ‘crisis’ was presented in UK media over a year, from April 2015. They demonstrated that a number of different names were given to the crisis, starting with ‘Mediterranean migrant crisis’, becoming the ‘Calais migrant crisis’ and then Europe’s migrant crisis. They show although the location of the crisis (and therefore the supposed level of threat to the UK) changed over this period, it remained focused on ‘migrants’. This changed when pictures of Alan Kurdi, a three-year-old Syrian boy who drowned in the Mediterranean on 2 September 2015, made global headlines. The previously named ‘migrant’ crisis became the ‘refugee’ crisis, perhaps because attention was drawn so explicitly to the human cost of the present border regime. At this point, public discourse briefly shifted away from derogatory categorisations towards the more sympathetic category of “refugee”. However, Goodman and colleagues also showed that this positive representation of refugees did not last long. The terrorist attacks in Paris in January 2016 soon came to be linked with the refugee crisis, and however tenuous this link (none of the attackers were refugees), the crisis quickly reverted back to being a ‘migrant’ one, from which point the focus of the debate has returned to being about how to prevent access. While this positive period of the ‘refugee’ crisis was short-lived, there was nevertheless a large outpouring of sympathy for refugees. Nightingale, Quayle and Muldoon (In press) examined how far such sympathy extended in public debate over a 6 month period from the 1st August 2015. Talk was drawn from a phone-in programme aired on Irish national radio that discusses relevant social and political issues. Because it has an estimated listenership of 10% of the Irish Adult population, there is a lot at stake for the callers. The analysis focused on speakers who were sympathetic to those arriving at Europe’s borders and specifically on those speakers who confronted the contentious issue of whether people should be offered sanctuary in Ireland. It was evident that although sympathetic callers reported their response to the unfolding “migrant crisis” as emotionally distressing, they found it problematic to advocate unconditional inclusive political solidarity with the migrants. For example, one speaker is highly direct and forceful as he points his judgemental finger at “you” the audience and accuses them of abnormal inhumanity if they do not experience the same distressing emotional response towards the “migrant crisis”. But when it comes to tentatively advancing a manifesto of inclusive political solidarity, his talk comes from a position of what he alone would recommend and is less demanding of the audience, more cautious and extremely ambiguous. He avoids explicitly mentioning Ireland and instead describes how the refugees “have to move west and west through Europe”. Notably it is no more than a request of what they “could” and not what they “should” be morally and legally obligated to do. Another caller recommends that refuge should be offered but makes it explicitly clear that it is only a temporary offer. We do not claim that the sympathetic speakers necessarily have an underlying hostility towards the people arriving at the borders of Europe. But what is apparent is that their attempts to advocate political solidarity with the migrants were constrained and tentative. It appears problematic for the speakers to promote a manifesto that acknowledges the rights of the refugees enshrined in international law. Therefore, they deploy repertoires of sympathy and advocate helping, but rhetoric that questions and undermines the status quo appeared to be off limits, leaving the speaker to adopt a paternalistic position. Other speakers appeared to advocate for Ireland as a site of refuge but struggled to express this explicitly to the audience. Instead they circumvented the issue and tried to make the case that something needed to be done for the migrants whilst keeping Ireland hidden as a place of refuge. Here there is a tension apparent between humanitarian values that potentially call for political solidarity with the migrants, and the pervasive understanding that the world consists of bounded nation states and that people belong to specific states (Billig, 1995). Hence, sympathy towards the migrants is restricted by the speakers’ concern for how the large national audience might interpret their position, due to the widely accepted moral imperative of bounded nations. The nation state has taken on a natural “foreverness” and banal nationalism is embedded in people’s everyday social and political practice. For those living in secure affluent countries, the integrity of national borders is imperative. The protection of privilege facilitates the construction of the derogatory category of “economic migrant” which is embraced by hegemonic discourse. By contrast, for the increasing numbers of displaced and desperate people, border regimes are literally killing them. Despots can starve, bomb, and enslave their citizens because they have nowhere else to go. Fences and derogatory categorisations may serve us well but they also beg the question of how long we can continue to shut the world out before we live in a self-constructed prison. If increasing numbers of people are trapped between tyrant leaders, religious fundamentalism, and the fences of the liberal west, the world is likely to become an increasingly dangerous and hostile place (Reicher & Haslam, 2016). We have demonstrated that the ways in which people talk about refugees are designed to promote specific arguments about their treatment. A number of arguments have been shown to be used to resist allowing access for refugees in ways that seek to prevent the speaker from being open to accusations of being unduly harsh or uncaring. These arguments have been shown to be effective ways of preventing refugees from getting the support they need. Although it is possible to present refugees in humanitarian ways that induce a more sympathetic and positive response to refugees, when sympathy is deployed its remit appears to be constrained by dominant discourses based on economic concerns and notions of the bounded nation state. As a result, sympathisers struggle to make significant political demands that would argue for the basic human rights of refugees and highlight the responsibilities of those who restrict their movement. Billig, M. (1995). Banal Nationalism: Sage Publications Ltd.
Goodman, S., & Speer, S. A. (2007). Category use in the construction of asylum seekers. Critical Discourse Studies, 4(2), 165-185. Lynn, N., & Lea, S. (2003). A phantom menace and the new Apartheid': the social construction of asylum-seekers in the United Kingdom. Discourse & Society, 14(4), 425-452. Nightingale, A., Quayle, M., & Muldoon, O. (In press). “It’s just heart breaking”: Political solidarity and sympathetic helping discourse within the “refugee crisis” debate. Journal of Community and Applied Social Psychology. Potter, J., & Wetherell, M. (1987). Discourse and Social Psychology: Beyond Attitudes and Behaviour: Sage Publications Ltd.
SPSSI-UK is a new development sponsored by the Society for the Psychological Study of Social Issues (SPSSI) to underline its commitment to internationalise its efforts and to embrace the significant contribution that UK psychological research can make to wider international debates. SPSSI-UK was founded to provide an independent arena for social and behavioural scientists based in the UK who are committed to increasing the impact of social and behavioural science beyond academia and informing public policy and debate in the United Kingdom and beyond. SPSSI-UK values the psychological study of social issues and regards psychology as connective tissue for the social sciences, linking societal, organizational, group and collective phenomena to individual perceptions, attitudes and actions. Relevant theory and evidence ranges from particulars of human behaviour and brain functions, to large-scale social movements, demographics, economics and politics. Psychology is in this sense key to understanding ways to bring about changes in attitudes and behaviour that are central to tackling many societal issues. SPSSI-UK has been launched in the form of three policy-focused conferences that brought together academic researchers and policy specialists who share a common interest in linking theory and practice to address significant social issues. The first two conferences were held at the University of Kent and Cardiff University. The Kent conference, held in June 2016, focused on ‘Equality, Security and Human Rights’, and the Cardiff conference, held in August 2016, focused on “The Current Migration Crisis in Europe". The 3rd meeting, on "Shared Space, Reconciliation & Respect” will be held on December 2nd and is co-sponsored and co-organised by the Centre for Identity and Intergroup Relations (CIIR) in the School of Psychology, Queen’s University Belfast, and the George J. Mitchell Institute for Global Peace, Security and Justice. SPSSI-UK is led by a Steering Committee that has the following members: Dominic Abrams (University of Kent, Chair), Natasha Ann Brigham (Project Manager); Rupert Brown (University of Sussex), Katy Greenland (Cardiff University), Miles Hewstone (Oxford University), Caroline Howarth (LSE), Tony Manstead (Cardiff University), Georgina Randsley de Moura (University of Kent), Rhiannon Turner (Queens University, Belfast), and Hanna Zagefka (Royal Holloway University of London). This committee is also advised by a ‘Development Group’, consisting of a much larger set of of academics and SPSSI members in the UK. Our aim is to encourage and sponsor further activities and to welcome UK-based psychologists who would like to join SPSSI. For more information about SPSSI and SPSSI-UK, or to get involved, please visit www.spssi.uk or email [email protected].